This is my build thread for this kit. 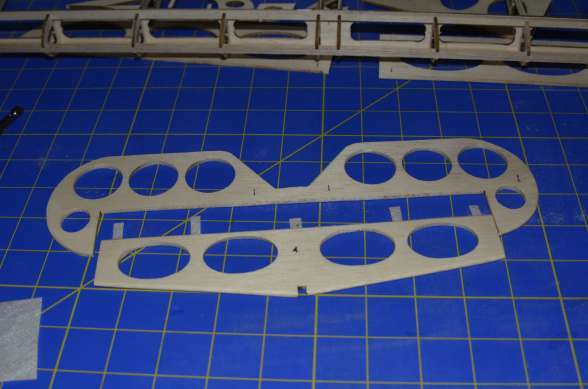 It shouldn't be too long as it is a fairly simple kit at only a 600mm wingspan and a one piece profile fuselage. I'll try to keep it as short and simple as I can, unless anyone needs more information, then please feel free to ask. I am always glad to help if I can. 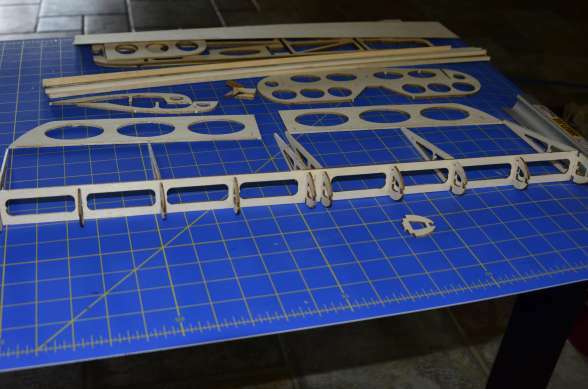 So, I dig in and organize the parts according to type: balsa sheet, balsa stick, laser cut flats, etc. Then it's time for the tedious part. 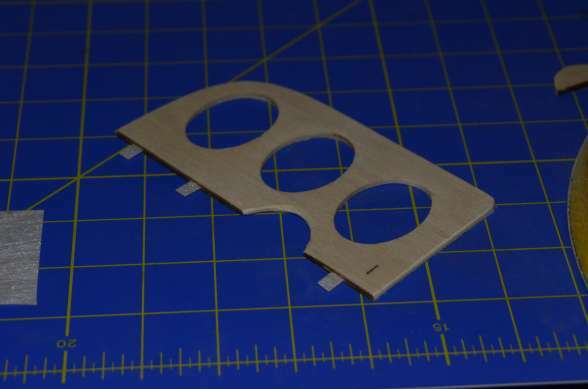 Removing the laser cut parts from the flats. 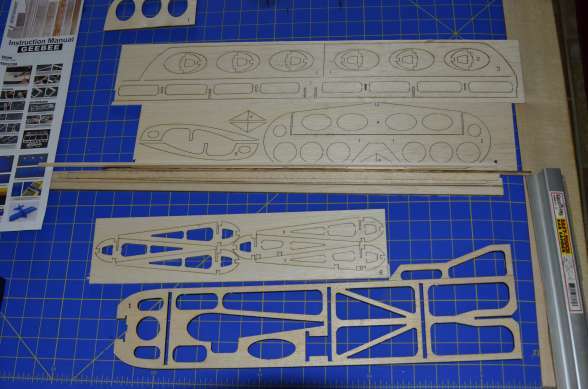 Take your time here as most of the parts are not only held in by purposely uncut areas, but also under-cut spots where the laser didn't penetrate all the way through. You can see these if you flip and look at the back side. 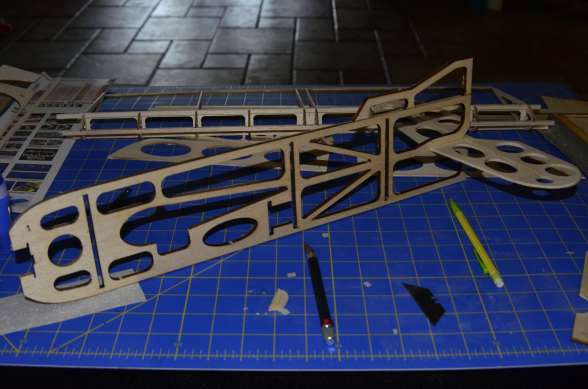 Here is a shot of partway through removing parts...Fuselage is out and starting on the ribs. Once that is done, I usually go over each part and sand any rough edges or fibers. Not really important to get everything, it just saves a little time later. One thing that is fairly important is sanding the ribs. I usually try to sand them stacked so they are all the same size, and you don't round off any corners or roll edges. Here they are ready for sanding. 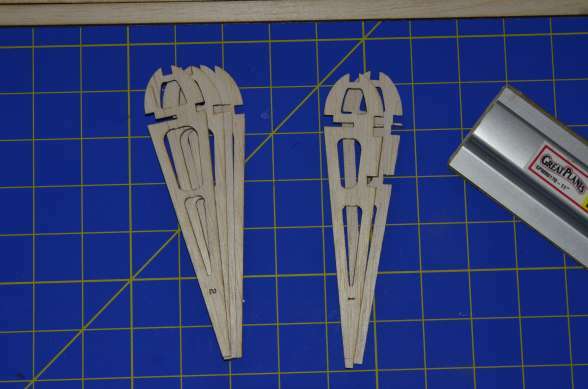 Once the ribs are done, I like to dry fit as much of the wing as I can, especially on these kits as the instructions leave a little to be desired. Not that they can't be followed, just they are lacking in detail. 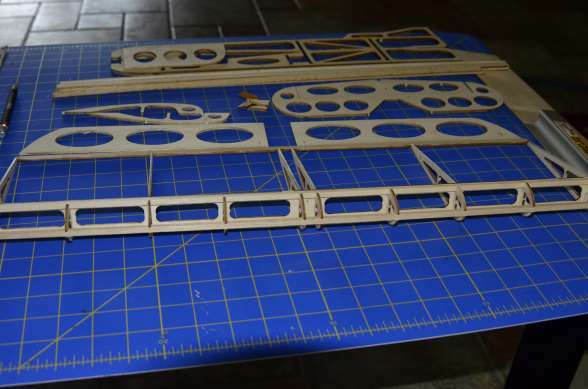 With these kits, everything slots together so you can dry fit almost the entire wing structure! Here is that underway. Here is a detail shot showing the interlocking fit. What is your take on the quality of the cutting for this kit? I've done a few kits from Hobby King and it seems like it's hit or miss. Some pieces drop out if you sneeze on them and others you can spend plenty of time freeing with a hobby knife. It looks like that wing really fits together like a 3D jigsaw puzzle, which is pretty cool. What are your glues of choice, CA or a longer drying type? One thing the instructions do not point out is the rib caps and trailing edge caps. Well, they do, but the picture is so small that if you don't know what they are talking about you will probably be lost on those parts. Anyway, on to the stab! It gets a good sanding to relieve the sharp edge only where it won't be against other parts; basically only around the outside and leave the hinge-lines and counterbalances alone for now. Once that is done, then it's time for some hinges. I am using some CA hinge material because I had it on hand. 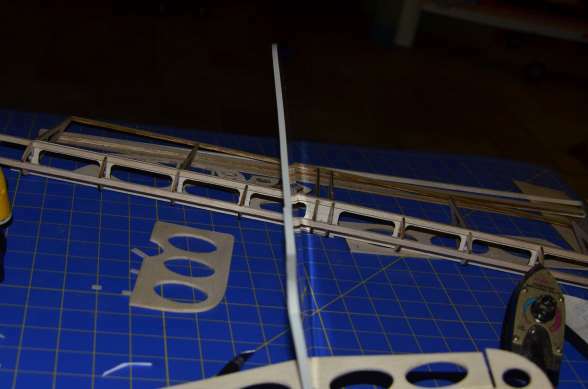 I start by cutting slots into the hinge-line of the Horizontal stabilizer and the elevator, making sure they are centered and also match. I usually cut one side then use that to transfer to the other, but however you prefer, as long as the slots on both elevator and stab match. Otherwise the hinges will not line up. Here is partway through hinging. And here it is hinged and beveled. I try to cut my slots before I bevel for control throw. 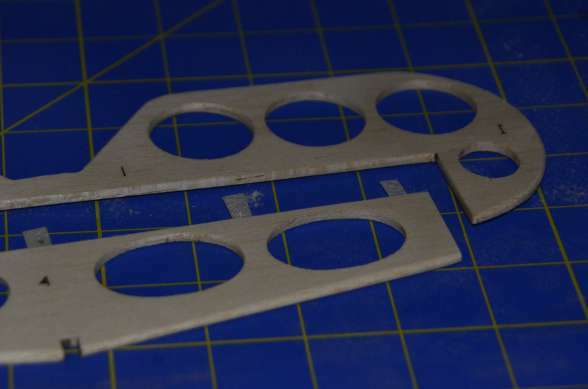 It seems easier to cut while it's still flat than trying to cut right at the point of the bevel later. 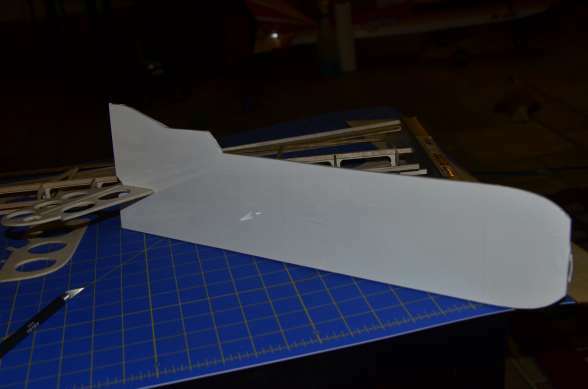 Here it is test fit into the fuselage. 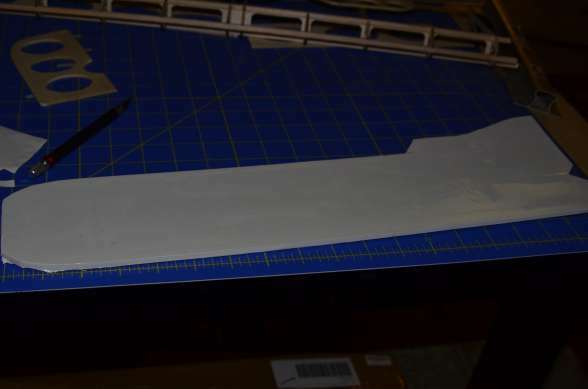 I have also glued on the cockpit/upper vertical stabilizer to the fuselage at this point. Rudder gets the same treatment after first cutting a relief for the elevator to move. Here is the fuselage all fitted up. No glue yet except for the cockpit piece. Still need to do a little more sanding in a few places. That's all I did today. I'll follow up when I make some more progress. How do you cover it, monocoat? To be honest the instructions haven't been much of an issue on this one. I looked them over once and then they pretty much sat there for the rest of the dry fit. I'll need to refer to them to see what they are lacking but this build really is pretty simple. I'm also thinking of going with a normal weight covering as opposed to an ultra light to help with the finished strength. 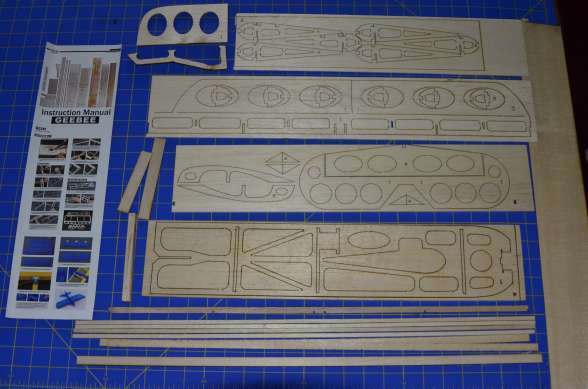 The balsa in this kit is very soft, but I have heard that seems to be the trend over the last few years in balsa. 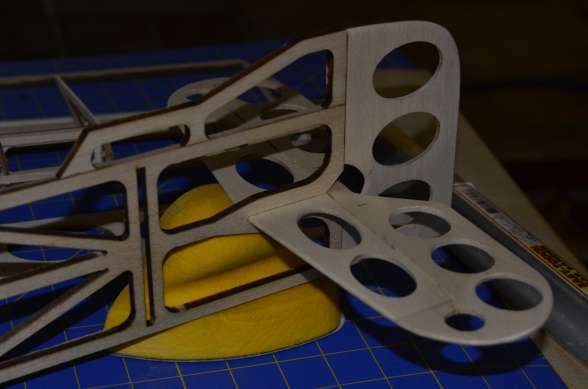 I'll make the final decision when I get it assembled and can test torsion and such. There are a variety of coverings that you can use but the iron on coverings like monokote are the easiest to use. Before you cover do you create small holes for air to escape? As example in your horizontal stab and elevator there are big circular cut-outs, the air-holes would join these pieces and also provide a spot for trapped air to get out from under the covering. I didn't know about that trick on the first three planes I covered but started doing that with one of my current planes. I wish I had known to do that earlier! The trapped air makes it hard to do a good covering job. Did you say your covering is coming from Hobby King? I'd like to get a good review of their stuff, the price is hard to beat and if the covering is good it'd be well worth the shipping cost getting a bunch of rolls. Too bad they don't stock it in the US warehouse! Monokote has a tool they call a woodpecker for this purpose. If you plan carefully it usually isn't an issue as most balsa is porous enough to allow the trapped air to escape. Where you run into real trouble is when you seal the tail or wing or cover over another color. Then those bubbles of air work against you. But all I have on hand right now are some leftover rolls of Monokote so I'll probably need to get some more and I've been looking at the stuff HK sells since it's 5 meters and most rolls of Monokote or Coverite are only 2 meter and twice the price! I'll let you know if I try it as to how it compares. Hey, they DO have it here now! That's news to me, thanks for the heads-up, I guess it's time to part with some more money! The woodpecker is something I've wanted for a while, but I thought that was used more for covering large flat areas to allow the air to more easily get through the wood. I'm thinking of the pockets of air that will be trapped when you have covered top and bottom of a surface and then start shrinking the film. The air needs to get out but is sealed in top and bottom so the small holes drilled into the piece allow that to happen. I can picture it in my head, but getting it to make sense after I've had a drink or two is causing me fits! I've never covered a plane before, when I looked at planes when I was younger it put me off from them. Then I found the ultra micro from parkzone. Now I just love foam..the durability just can't be beat. I would like to give this a try, and this seems cheap enough to give it a shot without breaking the bank..I'm going to look for a YouTube video on covering planes. You'll find a million of them, but better yet search RC Groups for a covering tutorial. One guy did a great job explaining and showing his way of doing it. Yeah, that's what I meant before when I said the sealed bits. What I have done before is to poke a few tiny holes in a part that is sealed down, usually along the edge, to allow the air to escape while shrinking. Then, a thin strip can be ironed down over the holes to seal them back up if it's a fuelie or if you're like me, and it will aggravate the OCD! So, I got anxious and decided to go ahead and cover the fuse. I had some white that will work with the transparent colors I plan on using for the wings and stab. Once you get sealed all over and around to the sides, trim off the excess and then seal down anything still loose. Once you get it all sealed down you can crank up the iron to the higher shrink setting, and shrink all the wrinkles out. On a flat part like this, it will bow towards the covered side. Not to worry, once you get the covering on the back side, it will straighten out. Now just repeat on the other side. Try to get the part as flat as you can when you seal the first edges. 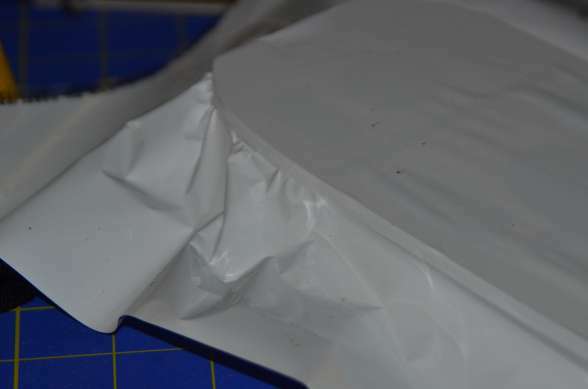 This will make sure you have enough shrink in the covering to pull the part straight when you shrink it. If you've been careful and patient, your part should not have any bow to it. 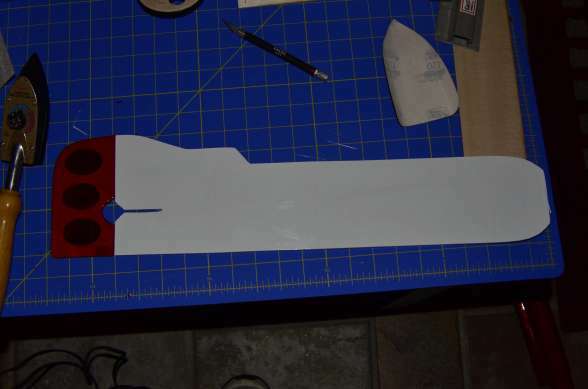 Here's the fuse with the rudder done in transparent red. You'll be done and ready to fly by the end of day today! Ahh I wish that were true! 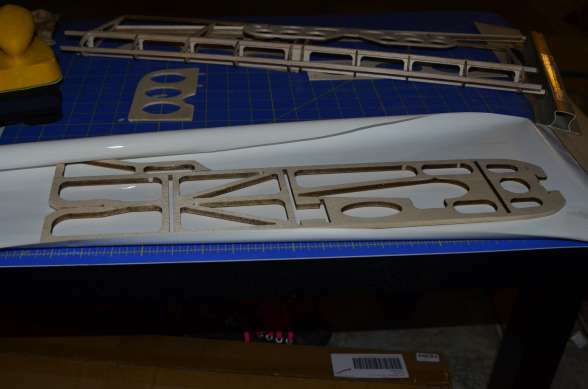 I am very low on thin CA which I will need to get some to start actually building the wing, so I am pretty much dead in the water for a few days. That's ok though, since I still need to get some covering for it, and since I'm going the HK route on that, I'll have some time to kill. I'd say go ahead and get one. 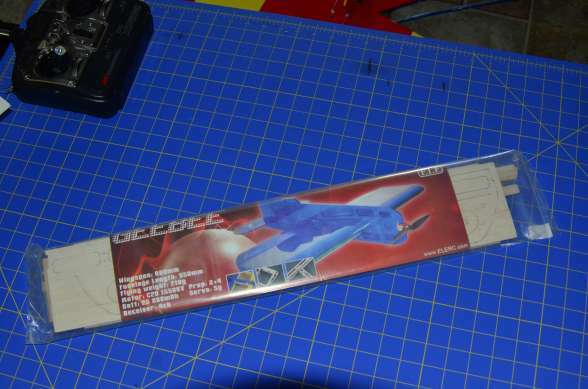 It's super cheap, you probably have everything you need to get it in the air already and if nothing else, it's more practice with covering balsa! Unfortunately I would need to buy all the electronics as most of my spare parts are going towards my contest plane, a from-parts build of a brushless Hobby Zone Super Cub, and the Red Swan. But parts are cheap, so no big deal (as long as my wife doesn't see the bill). So I guess that'll be one more plane on the assembly line! Yes, that's true about the wife. I tend to hoard my hobby stuff, so it seems like I always have a few motors and servos laying around. Comes in handy for those times when she's not too happy with my spending! I just placed my order for covering from the US warehouse and went ahead and got my CA there, too. I'm in Austin this week coming up so I wouldn't be getting anything done even if I had the glue now. Maybe I'll get home to a box of goodies! Anyway, I will update as soon as I have one. Epic.engineering, look what I found! He's using the Hobbyking films and judging by the look it's a comparable weight film to the normal weight Monokote. That's good to know! And he's got some good tips that I kind of touched on with the build but here it's on video form which is better for 'splainin'!